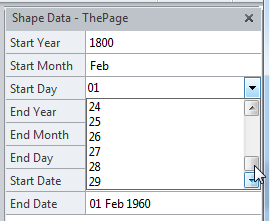 I was asked recently about making Visio timelines with dates earlier than 1900, which is the start of time as far as Microsoft Office products are concerned, so I thought I’d try to adapt one of my approaches used on other projects. In this case, I am assuming that the data is coming from an Excel worksheet, and I will use the Link Data to Shapes feature in Visio Professional/Premium. Visio Standard users can still make the timelines manually, or could attempt to use the older Database Wizard. In this example I have also included a column for the height of the timeline event shape, and a thematic area label (these properties were requested by the original Visio questioner). You simply make the End date the same as the Start date, if the event is just a moment in time. 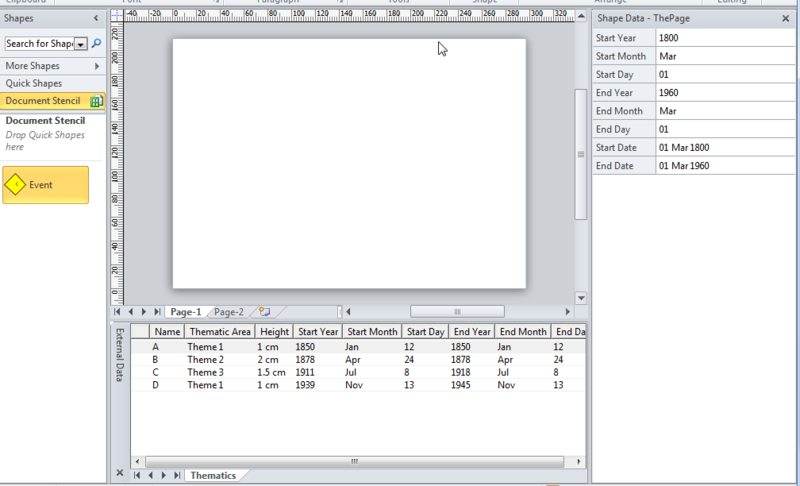 My intention is to use the page width as the timeline, where the left edge represents the start of the required period, and the right edge is the end of the period. Therefore the event shapes should automatically position themselves horizontally within this timeline, beginning at its start date, and its width representing its duration. I had to come up with a couple of trigger actions to ensure that the correct number of days are displayed for the selected month. 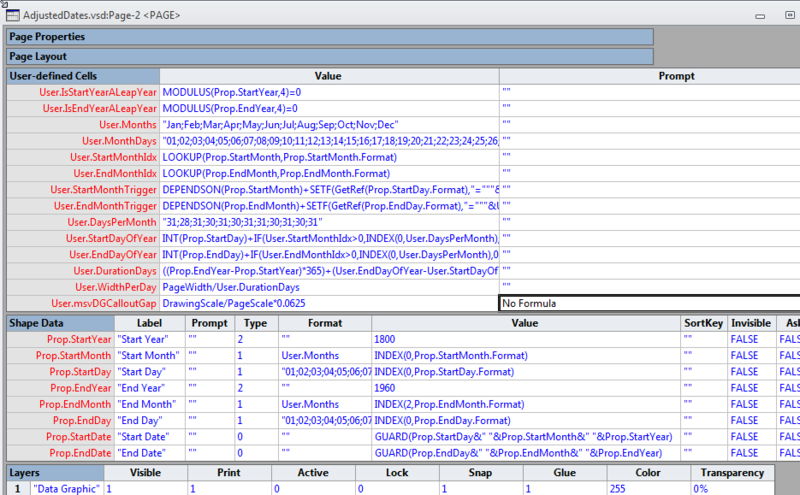 The StartMonthTrigger and EndMonthTrigger formulas will update the format cells of the Prop.StartDay and Prop.EndDay Shape Data rows respectively, with a drop-down list of the correct number of days for the year and selected month. The DEPENDSON(…) function ensures that the list is recalculated in time for you to be able to select a value from the drop-down list. I used concatenated IF() functions in the StartDayOfYear and EndDayOfYear cells, rather than nested IF() functions, because I have previously had nested IF() functions failing to evaluate when had more than 10 levels of nesting. The DurationDays cell calculates the number of days, with an adjustment for leap years, between the Start and End dates. All of the previous cells are leading up to be able to calculate the WidthPerDay cell value, as this will be used to horizontally position and size each of the Event shapes. 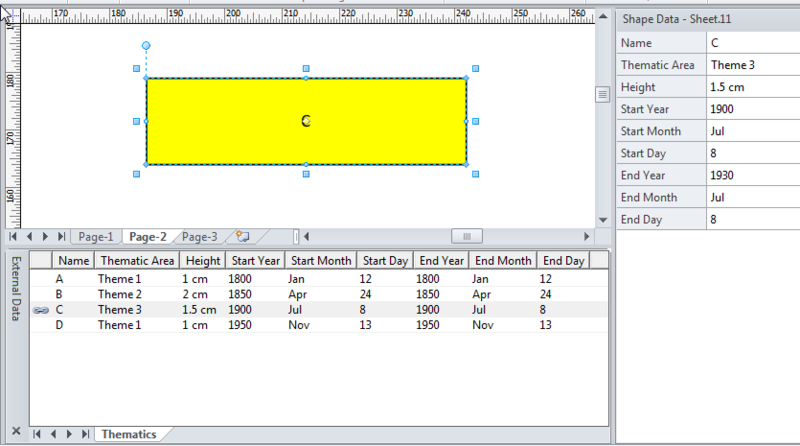 I created a few Shape Data rows, as per the table below. 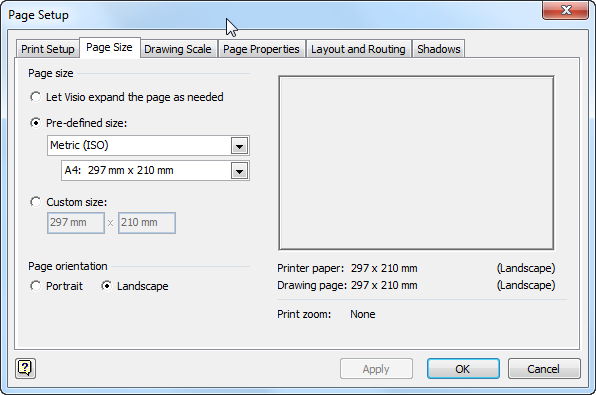 The StartDate and EndDate rows are provided purely for use in labelling, and are made read only with the GUARD(…) function. Now that we have set-up our page, we can return to the Event shape to complete it. Firstly, I unlinked the shape from the data because I have all of the Shape Data rows that I need. 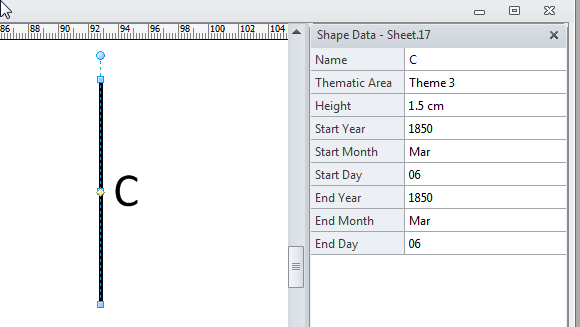 You can do that from either the right-mouse menu of the row in the External Data window or from the right-mouse menu of the shape itself. 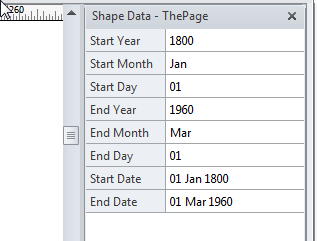 It is necessary to GUARD() the Type formulas so that the Link Data to Shapes feature does not change them. 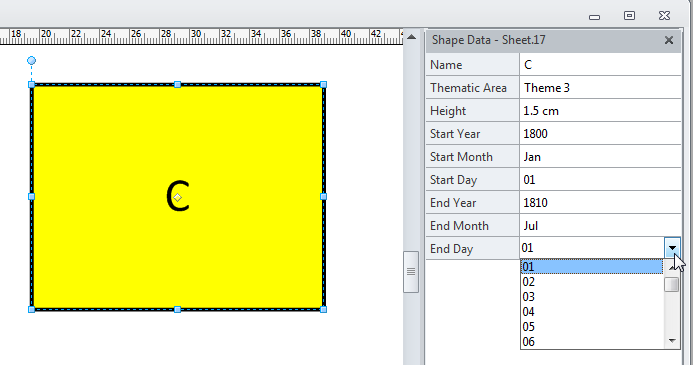 All of the values can be either entered manually, or they can be assigned automatically via Link Data to Shapes. I am assuming that the vertical position of the Event shape is moved manually. So, I need to have an alternative appearance for the case where the User.Duration Days = 0, or in other words, it is a milestone. This ensures that they are never simultaneously visible, and I get a diamond to represent a milestone, and a rectangle to represent an elapsed number of days. So, the Event shapes are automatically placed horizontally, and they can be manually moved vertically. Their widths are set to the equivalent of the duration of the event, or as a milestone diamond. Their colour is optionally automatically set according to their theme, and their height has been set from the data source.